It’s been awhile since I’ve read Gravity, but I knew I really liked it as a whole and was definitely intrigued by this alien race and the struggle between them and the humans. As with the first book, this took me a minute to get into. Not that I didn’t like the first half, because it interesting learning about Loge, but nothing really happens. The latter half though, is excellent and I was definitely glued to the pages. Ari took a minute to grow on me this time around. She’s doesn’t start off as tough as she was back on Earth. It’s understandable though, because she’s now on Loge, and it takes a minute for her to adjust to her surroundings, the fact that she’s part alien/Ancient now, and she is now challenged with a task that tests her strength and character. I think she was too in her head for the first half and it bugged me that she couldn’t see the “bigger picture” quicker. I definitely liked how she stepped up and finally showed how tough she was in the latter half and you see that soldier side of her that I really liked. Things with Ari and Jackson are strained for much of the book because of how he lied to her in Gravity. Trust me, I hate lying. No matter what the reason, I don’t believe in lying. Period. Regardless, Ari should’ve come to terms faster and addressed the issues with Jackson better than what I saw. Jackson does deal with his own problems in this book, but I would’ve liked to see more of them, as a couple, handling their situation. Also, it bugged me how much Jackson kept from Ari. It gets to me when guys think they should hide things from their loved ones to protect them or something. I’m an advocate for treating your significant other as an equal, especially someone as tough as Ari. Some girls can’t handle it, sure, but I think she could. But that’s just my personal opinion on the matter. I still adored Jackson at those moments when he let his guard down. You could really tell he cares for Ari deeply and there were quite a few moments that tugged at my heart because of him. Also, two words: Jackson. Shower. Anyways, Hover was a great sequel and I really like this world that Melissa created. I’m definitely going to check out Collide, the third book, to see how it all ends. If you enjoyed the first book, you’ll love seeing the alien side of things this time around. Fast Paced, Action Packed Sequel That Does Not Disappoint! There are two scenes in HOVER that I loved. The first involves Jackson's "dream" and the other involves water. You're welcome. The rest of the book had me on the edge of my seat with my heart in my throat and I loved every.minute.of.it! Once again Ari and Jackson will have to find a way to work together if they hope to put a stop to whatever Zeus has planned. It won't be easy, opposition greets them at every turn and the sacrifices may prove too great. But the fast paced, heart thumping action leads up to an ending that will leave you stunned, dumbfounded and anxious for the next book, which I TOTALLY NEED LIKE YESTERDAY! The cliff hanger killed me! I have to admit that it felt like Ari forgave Jackson too easily, but whatever. it was interesting how Melissa West talked about lodge. There was a war about to break loose on Earth because Lodge is dying and they need to go somewhere with life. I really wondered wether or not Zeus was good or bad or maybe just crazy. Ari is trying to negotiate/kill Zeus so that she can go back to earth. There is definitely more action and drama in this book, which I liked a lot because it made it feel more like a dystopia. I was also confused as to why Zeus wanted Ari, as he said in her dreams in the last book. That was not ever really said why in her dreams all of the ancients were bowing down to her and what not. There were some parts were I was confused, but I have to admit that the cliff hanger killed me, I mean KILLED. it has had to be one of the most cliff hangiest hanger in history. I also liked the new characters, such as Mamie and Emmy. I look forward to the next book so that I can be clarified on what is going on with everyone. Are the ancients bad or are the humans? Well hidden secrets,revelations,action packed and an unexpected cliffhanger you won't believe! Gravity ended with Ari arriving in Loge.Now,in Hover, she is trying to accept the fact that she's half Ancient and that she lives in a different planet with the help from Jackson and Emmy,her healer.She's pretty lucky because she gets to live with Jackson and his cousin and Emmy's grandson,Vill.Zeus makes her join the RES and she starts training with the rest of the group.The bright side?Jackson is her trainer. Moreover,she has found a safe way to communicate with Earth without Zeus knowing about it but things back home are not the same.Law is the President of the United States until his mother recovers from a heart attack and he seems distant towards Ari.On Earth,they expect Zeus's next step which is declaring war but they can't let that happen.So they ask from Ari to kill Zeus once and for all.In the beginning she hesitates but when Zeus orders that one human will be executed every day in order to take over Earth,she's more than happy to oblige. But apart from Zeus and his evil destruction plan,there's also Ari and Jackson.Ari can't forgive him for all the things he kept from her in Gravity.She's not ready for a relationship with him and he agrees with that but wishes for more.But throughout the book Ari uncovers secrets and truths about Jackson and the cruel way he was raised that makes her realize that she can't live without him. 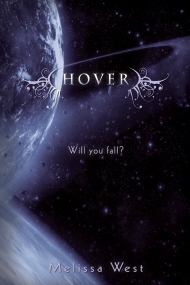 Melissa West in Gravity introduces us to a new world.In Hover this world is about to change.Well hidden secrets,revelations,action packed and an unexpected cliffhanger that you won't see it coming makes Hover one of the best sequels I've read and I can't wait to read the final chapter of this story in Collide.